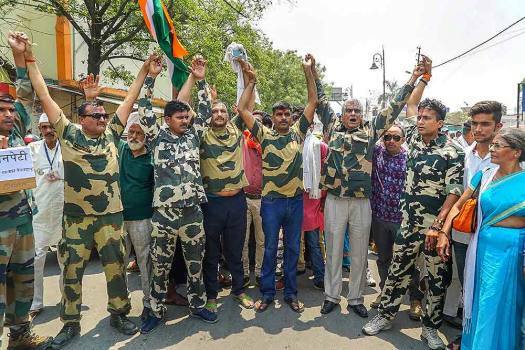 Former BSF jawan Tej Bahadur along with supporters arrives to file his nomination papers for Varanasi Lok Sabha seat, in Varanasi. 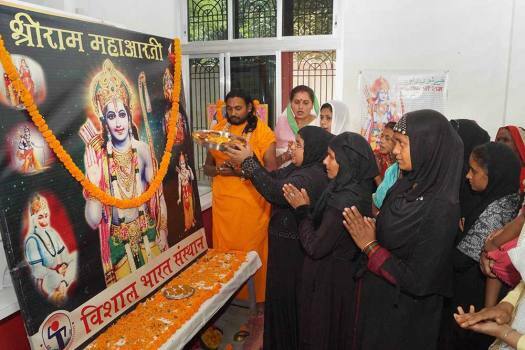 Muslim Mahila Foundation members offer prayers to Lord Rama on the occasion of Ram Navami festival in Varanasi. 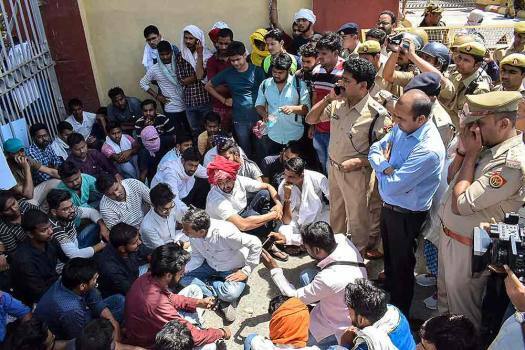 Students stage a protest against the killing of Gaurav Singh, a Banaras Hindu University student who was shot at by unidentified assailants outside a hostel, in Varanasi. 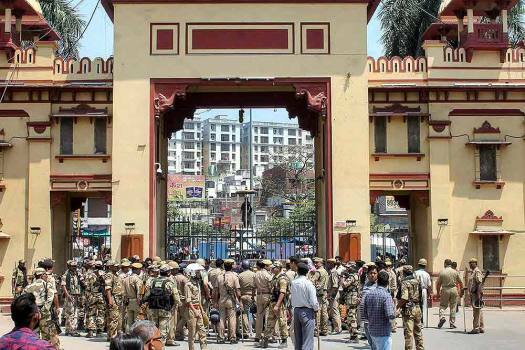 Police personnel deployed at the main gate of BHU where a student Gaurav Singh was killed Tuesday night by unidentified assailants outside a hostel, in Varanasi. 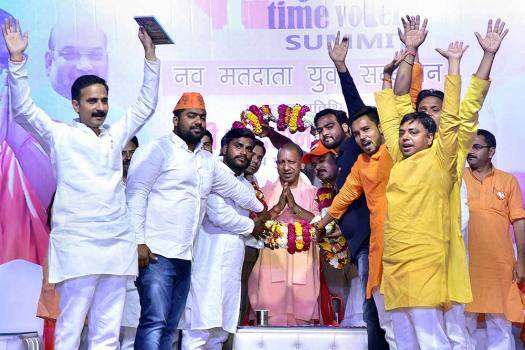 Chief Minister Yogi Adityanath is being garlanded by party workers on his arrival at the young voters' convention, in Varanasi. 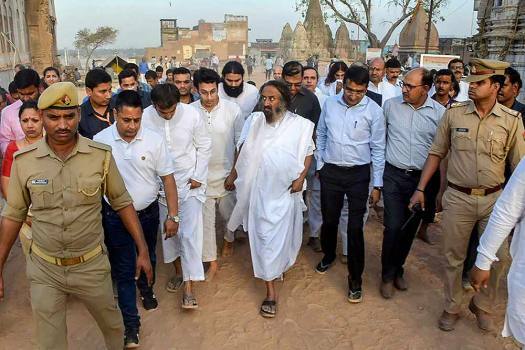 Sri Sri Ravishankar visits the Vishwanath Corridor of Darshan at Kashi Vishwanath Temple in Varanasi. 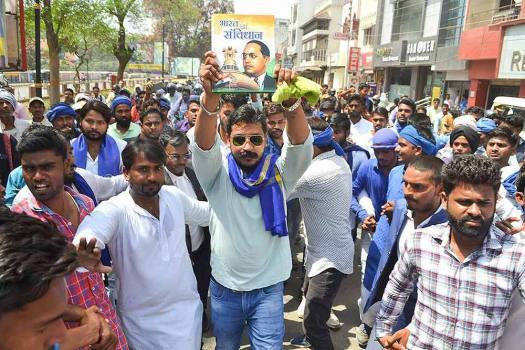 Bhim Army chief Chandrashekhar Azad and his party supporters during a roadshow, ahead of the Lok Sabha elections, in Varanasi. 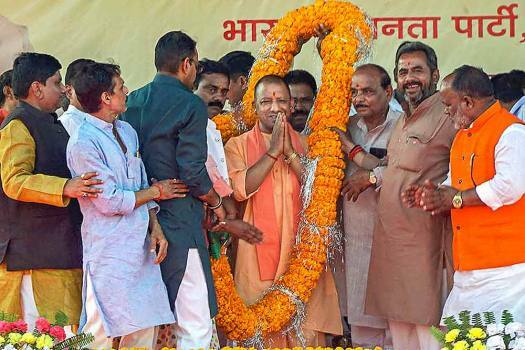 Uttar Pradesh Chief Minister Yogi Adityanath is being garlanded by his party supporters during BJP's Vijay Sankalp Rally, ahead of the Lok Sabha elections, in Varanasi. 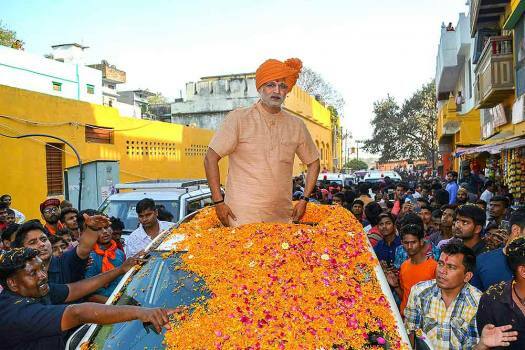 Bollywood actor Vivek Oberoi dressed as Prime Minister Narendra Modi during the shooting of his upcoming film 'PM Narendra Modi', in Varanasi. 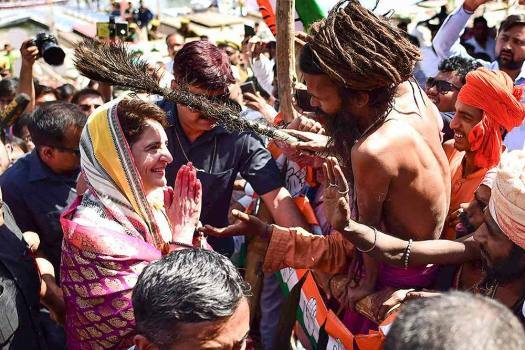 Congress General Secretary UP-East Priyanka Gandhi Vadra seeks blessings from a sadhu at Dashashwamedh Ghat, in Varanasi. Congress General Secretary UP-East Priyanka Gandhi Vadra arrives at Assi Ghat, in Varanasi. 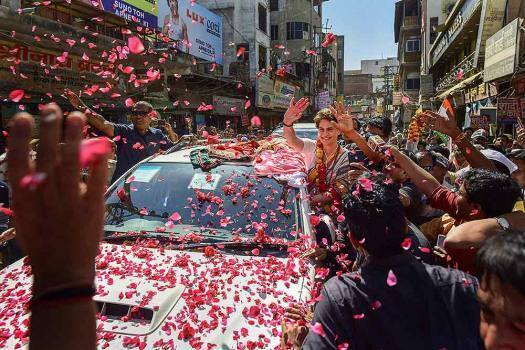 Congress General Secretary UP-East Priyanka Gandhi Vadra is greeted by her party supporters during a roadshow, in Varanasi. 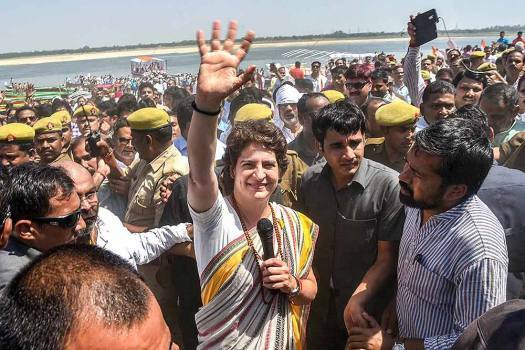 Congress General Secretary UP-East Priyanka Gandhi Vadra waves to party supporters during her visit at Assi Ghat, in Varanasi. 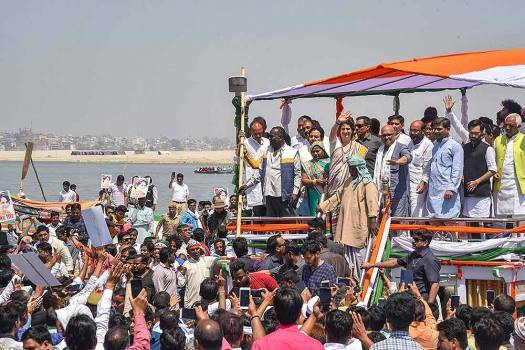 Congress General Secretary UP-East Priyanka Gandhi Vadra waves to her party supporters as she arrives at Assi Ghat, in Varanasi. 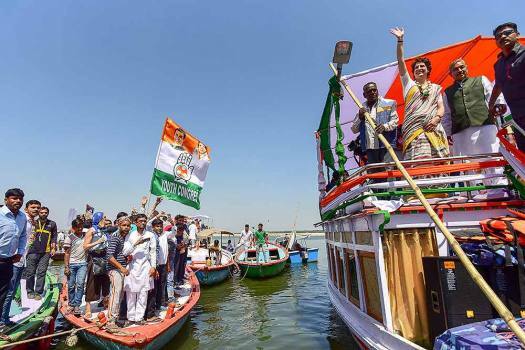 Congress General Secretary UP-East Priyanka Gandhi Vadra waves to her party supporters at Assi Ghat, in Varanasi. 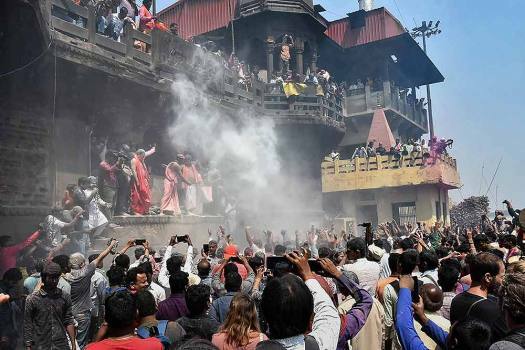 Devotees of Lord Shiva play Holi with 'Chita Bhasma' (ashes) at the crematorium of Manikarnika Ghat, in Varanasi. 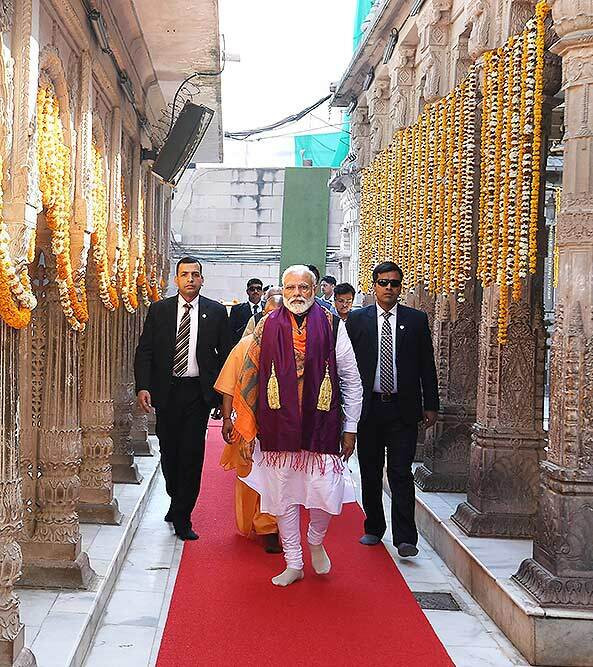 Prime Minister Narendra Modi visits Kashi Vishwanath Temple in Varanasi. Senior Congress leader Rajeev Shukla claimed that under the leadership of Priyanka Gandhi Vadra, who is the party's incharge of eastern Uttar Pradesh, the Congress would do well in the Lok Sabha election and sweep the 2022 assembly election. 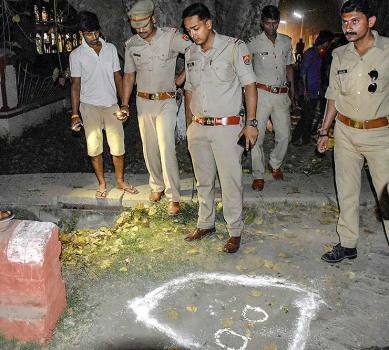 Gaurav Singh, who sustained bullet injuries in his stomach, was rushed to the Trauma Centre of Institute of Medical Sciences at BHU, where he succumbed to his injuries on Wednesday. 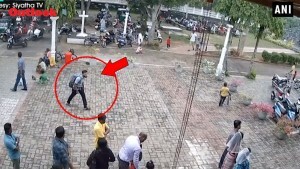 On Friday, the district administration granted permission to Chandrashekhar Azad, the founder of the Dalit outfit, for the road show from 11 am to 4 pm. After Priyanka Gandhi left the area, the BJP supporters gathered and started raised anti-Congress slogans. 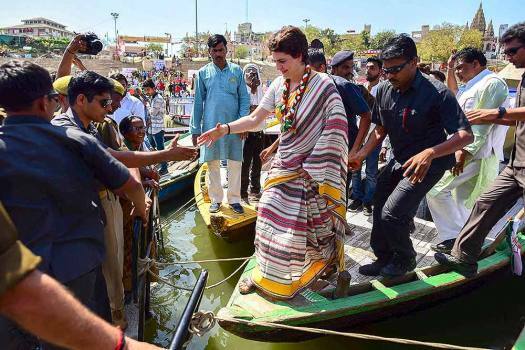 This will be Priyanka's fourth temple visit since March 18, when she kicked off her river ride from Prayagraj on Monday. Elections for Amethi and Rae Bareli represented by Congress President Rahul Gandhi and UPA Chairperson Sonia Gandhi, respectively, will be held in the fifth phase of polling on May 6. Varanasi, represented by Prime Minister Narendra Modi in The Lok Sabha, will vote last on May 19. Slamming previous governments of UP for delaying the project, Modi said had the Samajwadi Party government cooperated, he would today be inaugurating the project rather than laying its foundation stone. Another local Chandrasekhar said there was a tremendous job crisis and hoped the manufacturing sector would be revived. Modi seems to have held his appeal intact in Varanasi, a city suspended forever between a neo-Hindutva and ancient Hinduism. These BHU administrators sound more like some mullahs of the Muslim Personal Law Board holding on to their triple talaq. Misogyny seems to be their only sanskar. BHU's student, who was part of the entire sequence, describes her ordeal ever since they raised demands for greater security against sexual harassment.